Crash Team Racing is the kart racer that I grew up playing. I remember spending countless hours playing the original game on the PS1 with my brother – it’s probably my most played game of that era. I’ve always preferred it over Mario Kart (don’t @ me Nintendo fanboys) and I’d always loved revisiting it when I was stuck for games to play. CTR is a game that I have wanted to see brought into the current-generation light for a while, and after the impressive remasters for the Crash Bandicoot and Spyro trilogies I felt that updating the game to make it more visually appealing and handle a little better (the game actually already handled pretty well) would be more and more reasonable. 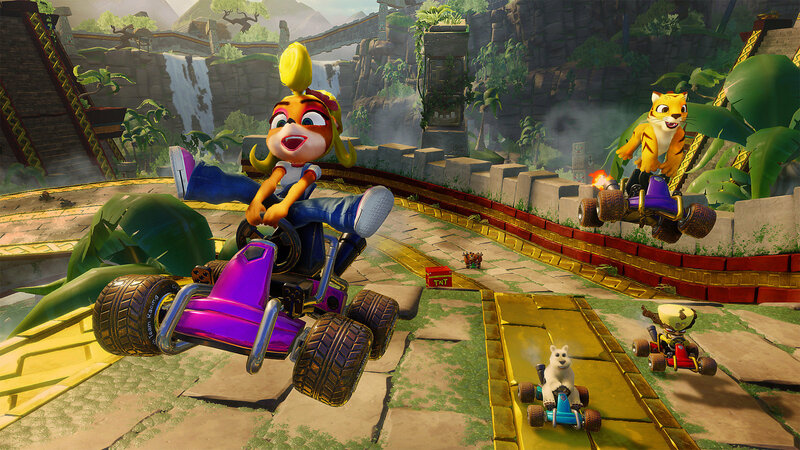 Thanks to Activision I got to go hands-on with the upcoming Crash Team Racing Nitro-Fueled title recently, and thankfully it felt exactly how I wanted it to. There aren’t too many things to say about CTR, as it’s more or less the CTR that you know and love mixed with Nitro Kart and some tastier visuals. However, that doesn’t mean it’s not something worth looking at. The preview build I played only had four tracks available, including Sewer Speedway which is a favourite of mine. In addition to this, there were only around ten characters to use but this roster size will be larger come the full release. So as someone who would revisit the game from time-to-time, how did it feel? Again, the game holds up surprisingly well for a 1999 release, much better than some other games from that era of gaming. In saying that, Nitro-Fueled has some minor updates to its gameplay to make it snappier and more responsive. My familiarity with the game translated almost perfectly and being able to race on Papu Papu’s Pyramid and Sewer Speedway elicited an instinct that I don’t really get to employ very often. Racing on those tracks from my childhood was bittersweet, seeing as some of the folks from IGN Australia were there and I got to show them how WellPlayed does it (in a lighthearted way of course). CTR’s very clever level design is something that makes it stand out from the other kart racers. The maps, while not dynamic, have an intricate level of design that hides a variety of secrets, including hidden item boxes and shortcuts, some of which are hidden in plain sight and disguising themselves as simple environmental objects or entities which are not in the immediate foreground. Something I always enjoyed about CTR was the powerslide boost system. While not an entirely foreign concept, it works differently to what most of us are used to with Mario Kart where you start a powerslide and wiggle your controls side-to-side to charge up some boost. With CTR, to perform a powerslide you need to do things a little differently. Instead of tilting side-to-side to charge your boost, you maintain control of your character and wait for the bar on the bottom right of the screen to become red. As soon as it does, pressing L1 will make your character perform a boost. To get the most out of a powerslide you’ll need to perform three consecutive powerslide boosts. CTR’s graphics are one of the few facets where the game has obviously aged poorly (it’s not the only game from the PS1 days to do so) and adding multiple screens into the game would lower the quality of the textures quite noticeably to preserve performance (a smart move). Thankfully, this remaster has breathed new life into the game and the reimagining of the art is spot on. It pays respects to the artist’s original visions and amplifies the environments. Colours really pop and the animations are fluid. Good job, Beenox. I’m very excited about getting to re-live CTR all over again in higher visual fidelity. Plus, the game handles exactly how I expected it to and that’s a great thing. I can see this reimagining of Crash Team Racing being positively received by newcomers and fans alike. Colour me keen.